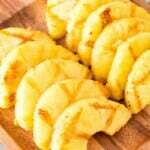 Home » Grilled Pineapple – Two Ingredients! 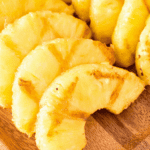 Grilled Pineapple – Two Ingredients! 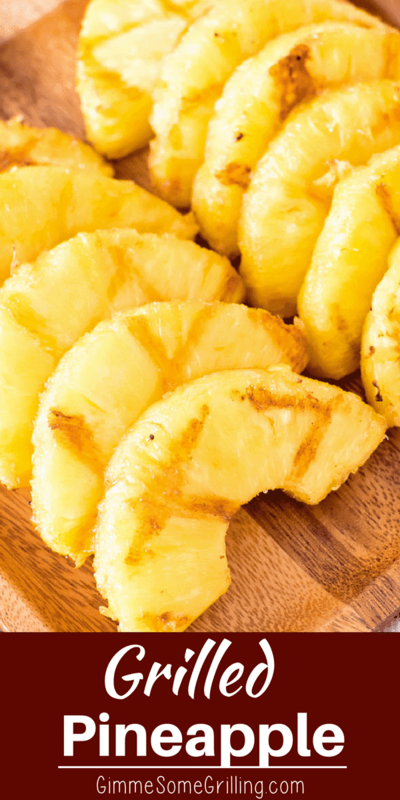 This delicious pineapple is coated in brown sugar and then grilled to perfection! It only requires two ingredients and five minutes. You can eat it for a side with the rest of your meal or as dessert it’s that delicious! I love pineapple. I’ll take it in any form that I can get it. I’ll definitely take this delicious grilled pineapple! 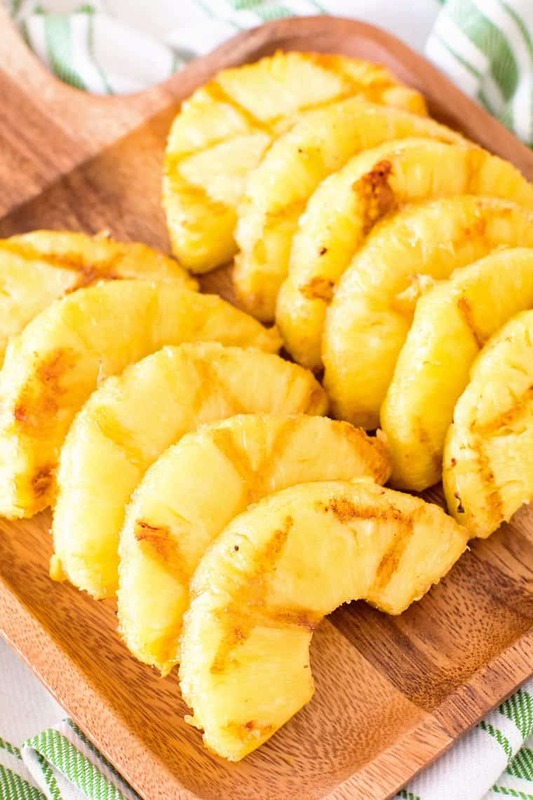 I love that it’s only two ingredients, pineapple and brown sugar, that it’s ready in 15 minutes which includes the marinating time and that it’s refreshing! 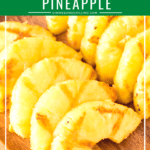 You can either serve this easy grilled pineapple as a side dish to your favorite grilled main dish or even serve it as a dessert. I personally think the dessert is an awesome idea because it’s a bit lighter but it’s so sweet you will still be satisfied. The brown sugar glaze becomes caramelized while the pineapple grills and it’s sinfully delicious. Love or hate? It seems like it’s an either/or there. There’s no I kind of like pineapple. People feel very strongly about it or that’s what I’ve came to the conclusion to over the years. Personally I’m a pineapple lover. Give it to me plain. Give it to me on pizza. Give it to me on kabobs. I’ll take it anyway I can get it. My girls are the same way. They both love it and it’s one of their favorite snacks. I was just talking to my mom about their love for fruit. Miss K is a strawberry lover and pineapple lover. Ry will eat any fruit she can get her hands on. It can be raspberries, blueberries, strawberries or pineapple. Koert is right there with her. In the summer I could go through an entire watermelon a day if I let them! I often serve fruit to them for dessert because they think it’s such a treat. 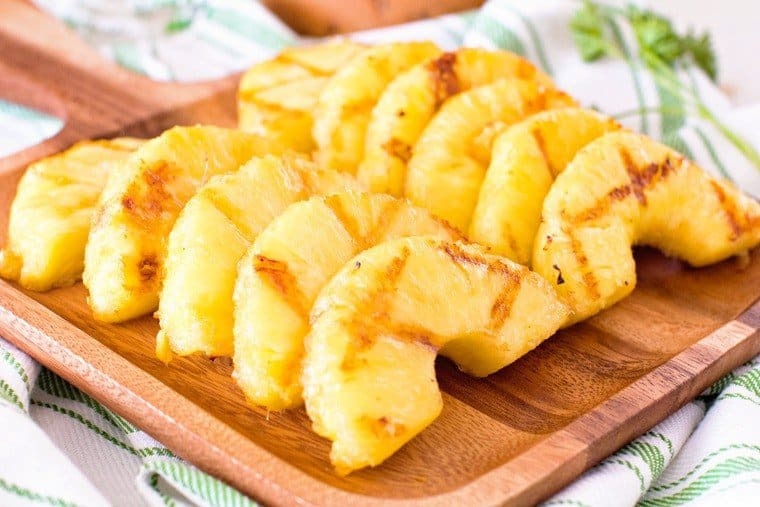 You can bet this grilled pineapple is going to go on that list! I might have to fight them for it. First of all it might be the simplest recipe ever. Can I even call it a recipe when it only have two ingredients? The first step is to simply clean and grease your grill grates. Preheat grill to 350-400 degrees. cut the rind off of the pineapple. You’ll then want to cut it into slices or wedges. 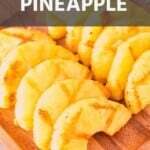 I personally use this pineapple cutter and it works great. Then I just slice the pineapple about 1/2” thick. After that I place it in a gallon Ziploc bag, but you could use a container. Sprinkle it with the brown sugar, toss to coat and let is rest 10 minutes. Place on grill and grill each side 2-3 minutes, rotate 45 degrees and grill an additional 2-3 minutes. Then flip over and repeat. You can also make this in a grill pan on the stove if you’d like to make it indoors. Also, some people like to add cinnamon with the brown sugar. If you’d like to do that add about 1 tsp cinnamon when you sprinkle the brown sugar on the pineapple. 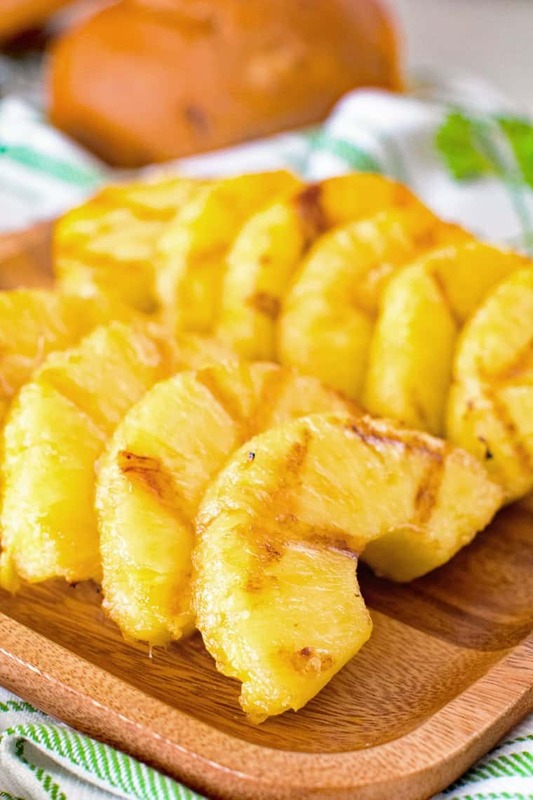 This delicious pineapple is coated in brown sugar and then grilled to perfection! It only requires two ingredients and five minutes. You can eat it for a side with the rest of your meal or as dessert it's that delicious! Clean and oil grill grates. Preheat grill to 350-400 degrees. Cut rind off of pineapple and core out. Slice into 1/2'' slices. I also cut them in half. It's up to you. You can also slice them into spears. Place pineapple on grill and brush remaining brown sugar that's left in bag or conatiner over the top. Grill each side 2-3 minutes.